Nothing says fall in Canada like hot apple cider, fresh baked apple pie, or packing your child’s lunch with a shiny apple for snack time. 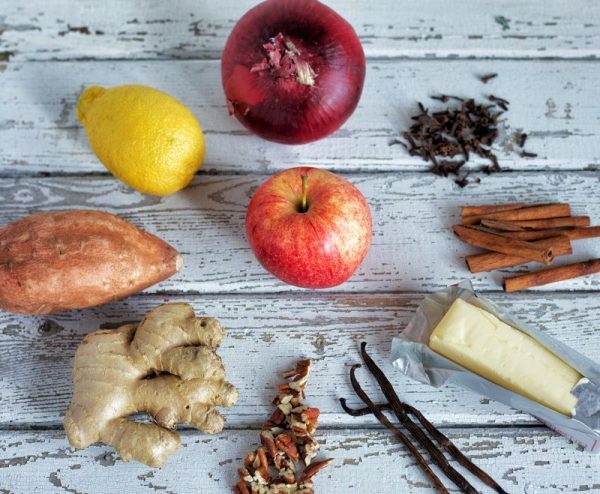 Apples are prized for their aroma, flavour and health benefits, and there’s a variety to suit every taste. Whether you like a sweet or tart apple, or are looking to eat it fresh or consume your apples cooked, there is a perfect apple for every occasion or dish. High in pectin and flavonoids, the latest health-related research suggests apples may reduce the risk of: heart disease, high cholesterol, some cancers, stroke, COPD and Type-2 diabetes. It seems the old adage “an apple a day keeps the doctor away” may in fact be true. Ambrosia – Sweet, crisp, low acidity – great raw and in salads. Cortland – Mild, sweet taste and crisp texture. Excellent for salads and fruit plates; resists browning. Good for pies and sauces. Crispin – Tart to sweet taste and firm texture. Delicious in pies and chunky sauces. Empire – Slightly tart, juicy, and crisp – great raw, in salads and sauces. Fuji – Great for eating fresh. Gala – Sweet, fragrant, and crisp. Enjoyed raw and in salads, pies, and tarts. Golden Delicious – Firm, juicy apple that keeps its shape when baked. Also, delicious cooked for applesauce. Honeycrisp – Sweet, juicy, and crisp – great raw. Idared – Tart and maintains flavour when baked. Jonagold – Firm, slightly coarse texture. Great for eating fresh and cooking. Macintosh – Mildly tart, juicy but sweetens as it ripens – great raw, in salads, pie, sauce, and for baking. 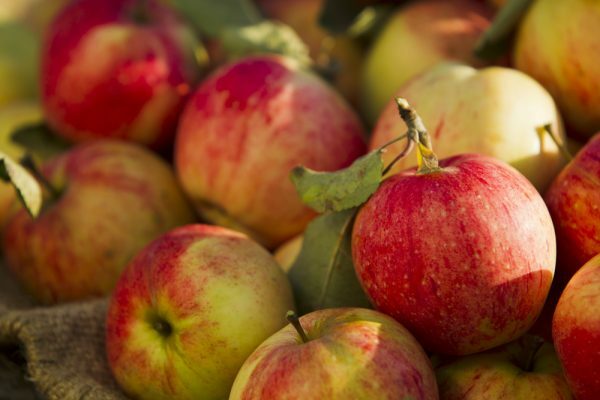 Northern Spy – Excellent for pies and baked apples. Red Delicious – Excellent for eating fresh and in salads. 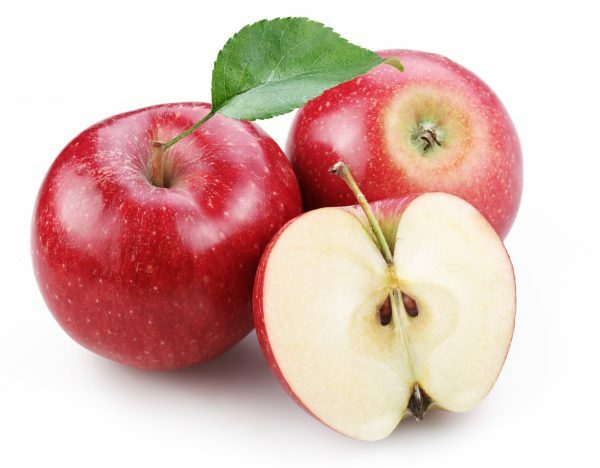 Red Prince – A versatile apple, suitable for eating fresh, cooking and baking. Russet – One of the oldest varieties in Ontario and more popular in Europe. Great fresh, in applesauce and baked. Spartan – Delicious fresh and baked in a pie. SweeTango is another Canadian variety, grown in Nova Scotia and Quebec – Very crisp, sweet and tangy apple. Great fresh, cooked, and baked. 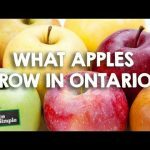 For seasonal availability information by variety, visit Ontario Apple Growers. 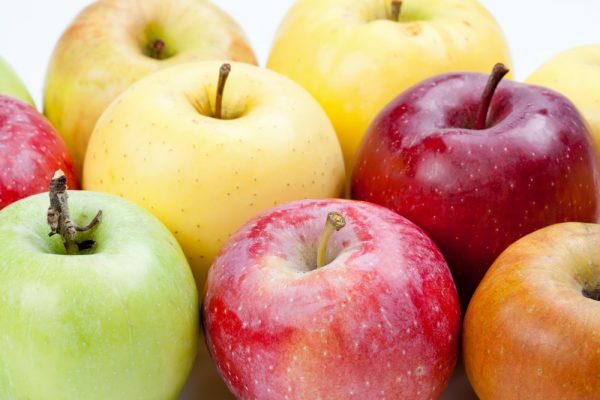 Select firm and vibrantly coloured apples that are free from bruises or punctures. Fresh apples should have a bright, pleasant aroma and tight skin. Apples should be handled with care, as they can bruise very easily. Brownish freckled areas do not affect flavour and naturally occur on certain varieties. Some apples are best for eating out-of-hand, while others are best enjoyed cooked or baked. Be sure to refer to our information about varieties above to find the type that suits your needs and preferences. Store apples in a cool, dark place or keep them in the refrigerator crisper, in a plastic bag. Apples produce a natural ethylene gas that speeds the ripening of other fruits so be sure to store apples away from other produce, unless you want to speed up their ripening time. To Freeze Apples: Remove the peel and core before cutting into slices. Lay the slices flat on baking tray, and place in the freezer. Once the slices are completely frozen, you can place the slices into freezer safe bags or containers and store in the freezer for up to 8 months. Frozen apples lose their crisp texture, so they are best used in cooked recipes after thawing. Another idea is to cook apples first, such as apple sauce and then freeze them in an airtight container. Whether baking, caramelizing, deep-frying, grilling, poaching, eating fresh, sautéing, or adding to a salad, the uses for apples are endless. If you are slicing apples to eat fresh, toss them with a bit of lemon or lime juice, or acidulated water (1 cup water to 1 teaspoon lemon juice). This will prevent them from browning if you do not plan to eat them right away. The best technique to peel an apple is to use a vegetable peeler over a knife; a knife will take away too much of the juicy flesh. It takes four apples to make a glass of pure apple juice. Three medium apples equal about 1 lb. (500 g). One medium apple yields about 1/4 cup (175 mL) of sliced apples. Lighten up your baking: when a recipe calls for oil, substitute half with smooth applesauce. There will be fewer calories and no difference in taste although baking times may vary slightly. 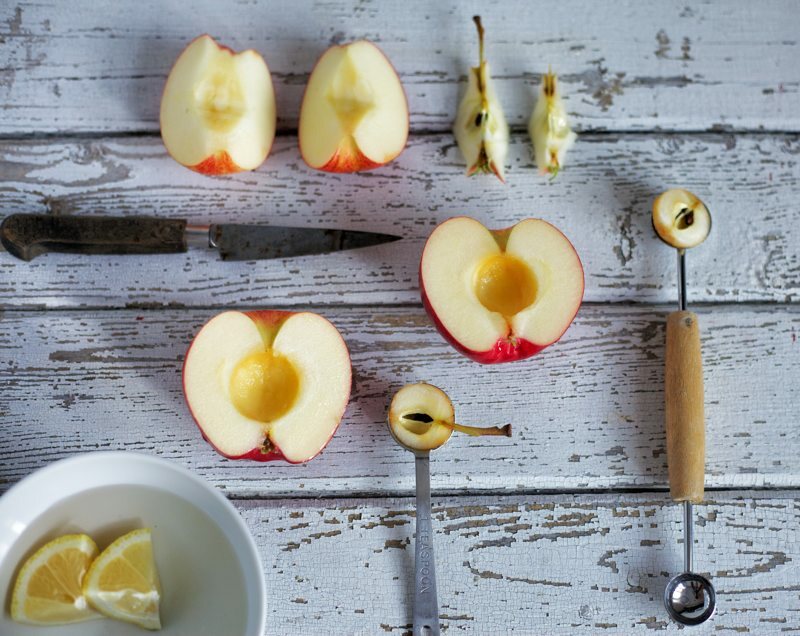 Use a U-shaped peeler instead of a knife to peel apples. In a recipe, one medium apple yields about 1/4 cup (175 mL) of sliced apples. Cooked apples go very well with meat such as pork and chicken, as well as vegetables like potatoes and cabbage. If you don’t have a melon baller to core an apple, use a measuring spoon – a ½ teaspoon works best! Apples that are a little older can be revived. Just chop them into large chunks, coat with cold apple juice and pop them in the refrigerator for half an hour. Apples produce a natural ethylene gas that speeds the ripening of other fruits. Simply place an apple in a paper bag with the other fruit you’d like to ripen. Leave the bag open to allow it to breathe and store on the counter out of direct sunlight. Calling all juicers! Apples are a perfect base for fresh juice. Combine with carrot and some leafy greens for a healthy, delicious home pressed juice. What Do Apples Go Well With? When there is an abundance of local apples, apple sauce is an easy go-to but if you want to step it up – make apple butter! Simply cook apples until they are very tender and caramelized brown. 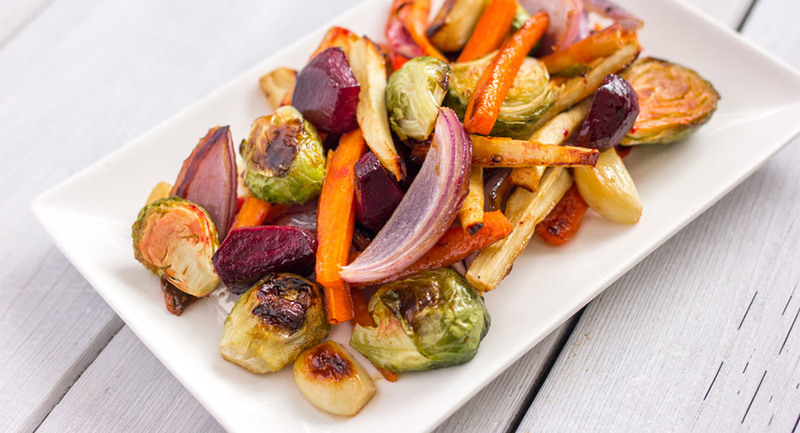 Puree or blend to use over toast, pancakes, or even use as a glaze for roasts. 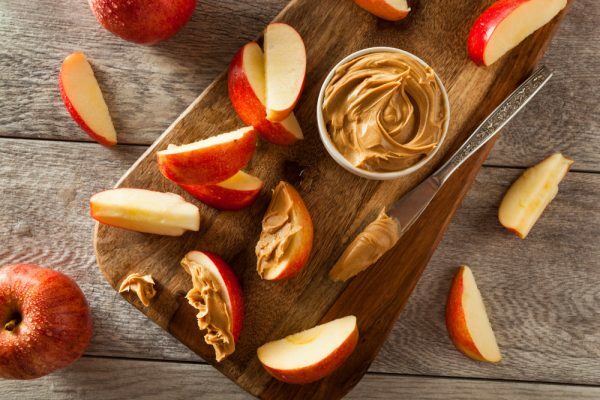 Apples are delicious to eat out of hand but can also be used to make delectable snacks in various forms. Try making apple Oka bites as a fun appetizer, or try making apple leather, apple turnovers, or decadent  apple cream cheese squares. For those days you just need something simple and home baked, try making an apple tart, apple cupcakes or this apple strata. Apples aren’t just tasty in sweet treats; they are amazing in savoury meals as well. Chicken apple sauté is tasty, easy to make and full of fibre. Apple quesadillas and apple stuffed squash are great ways to enjoy the bright flavour of apples in savoury dishes. 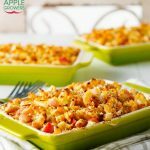 Apples can be added to mac and cheese for a fun twist. Or try it in this wild rice and quinoa salad for a delicious crunch. Roasted Ontario apple gravy can bring a natural sweetness and seasonal flair to your favourite fall and and winter holiday meals. It also happens to be completely vegan (if you use vegetable stock) making it an excellent option for those with dietary restrictions. Nothing could be more economical than cooking with cabbage and apples this time of year, so consider this cabbage, smoked sausage and apple soup for your budget-friendly weeknight dinners. 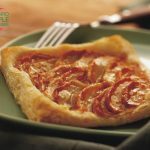 Ontario apple and chicken turnovers turn store-bought favourites – rotisserie chicken, apples and frozen pie crust – into a simple-to-make meal for the pressed-for-time cook. 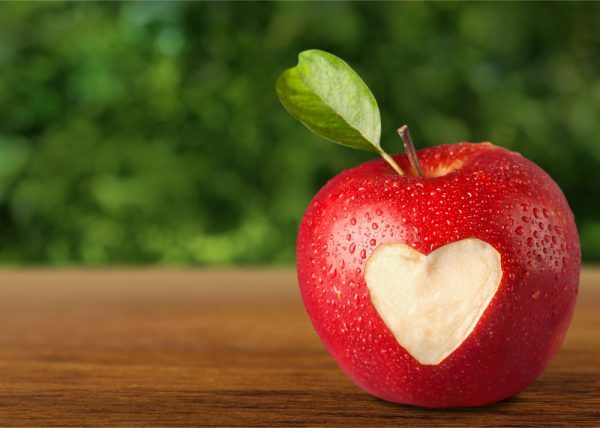 According to the Canadian Nutrient file, one medium apple contains a great number of your daily-recommended intake of nutrients: just 72 calories, no fat11% of Vitamin C, offers 10% of fibre, and 4% of potassium.